Picking out a shopping cart before heading into a store should be the least of people’s troubles. While it seems like such a simple decision, getting that unlucky cart is all too common and can annoy your customers fast. As crazy as this scenario may seem, a bad shopping cart could cost your store business. Picture this: A shopper after a rough day trying to run an errand and accidentally picking the most annoying cart. This might be enough for them to forget shopping altogether for the day. Don’t let bad shopping carts disrupt and negate from the good shopping experiences you provide your customers with. Below are a few of the shopping cart mishaps that could be making your customers frustrated on their trips to your store. Learn about them and replace your carts if these annoyances sound all too familiar. No one wants to be that person traveling around with a squeaky or loud cart. Not only is it annoying to the person who’s mistakenly picked the cart, but it can make them feel like they’re annoying others in the store as well. Are you always trying to go in a certain direction while your shopping cart is in complete disagreement? 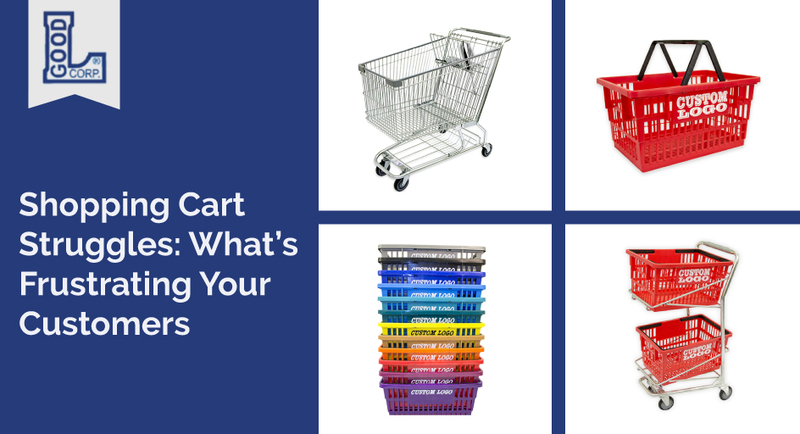 Whether your store’s shopping carts are always veering towards the right or left, or if their wheels stop spinning completely when shoppers are trying to maneuver around, this is bad news for any store. One thing that can be especially frustrating to customers is if your aisles are too narrow for the carts you’ve provided them with. If this is the case, they will just take up space, as people will choose to forgo using your carts. Make sure that you choose the right size of a shopping cart for your store or that your store’s aisles are wide enough to accommodate for a standard sized cart. Your store should have options for people who are making big shopping trips as well as for those running a small errand who don’t want to load their hands with items at risk of dropping them. Be sure to provide both baskets and shopping carts available to those who visit your store. They will appreciate having a choice between the two.